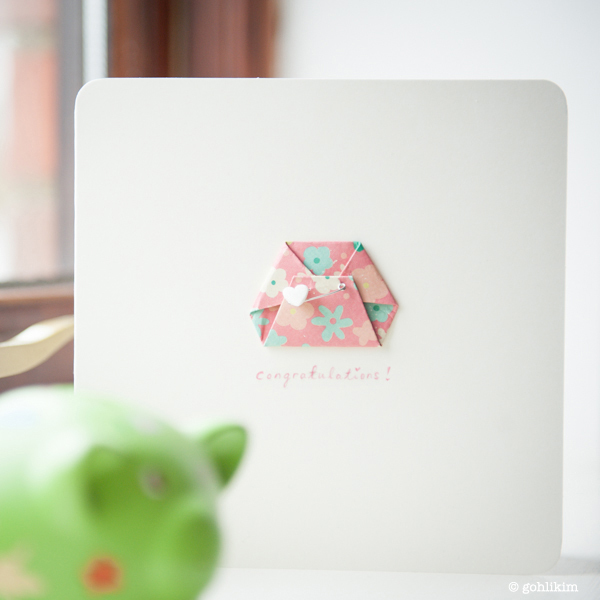 I created this baby congratulations card for my friend new baby girl. I actually used the real flat cloth diaper fold – kite fold method to fold this on a piece of 3″ x 3″ scrapbook paper. Below is my simple sketch how to fold. Use a safety pin to secure it in place in the center when done folding. If you have trouble poking through all the layers of paper (especially the paper you used is too thick), you can cheat by using glue, so the safety pin only goes through the top layer of the origami diaper. Give the safety pin a little touch by gluing a piece of heart shaped sugar sprinkle to it. This card is so simple to make and the results are cute. You could use it for baby announcement, or baby shower card.